“…an agreed, co-ordinated financial plan to enable all parts of the business achieve its objectives over a specified period of time”. Often, a budget will be prepared a year in advance, but it could be on a monthly or quarterly basis. Budgeting is anticipating what you think will happen in the future and planning for it. 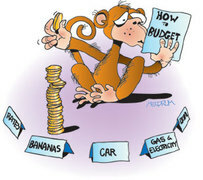 Budgets for individual areas should link together, so the production budget should be based upon the sales budget. The marketing budget must take into account how much we can make etc. They provide targets for people to work towards, and so should therefore be motivating. They allow planning, so problems can be seen and action taken before a crisis emerges. They allow delegation. Managers can afford to allow juniors more freedom because they have these pre-set limits to work within and so can’t go too far wrong. Can check the performance of the organization, as you have already worked out how well you think it is going to do. If targets are too hard to reach employees might settle for an easy life rather than working hard to try and meet a target that they won’t reach anyway. People may resent having targets imposed on them, so it’s important to involve them when setting the budget. If budgets are too rigid, then opportunities may be missed. For example, if all of the promotional budget is spent, and an export opportunity comes up, then it would be stupid not to follow up on it just because the promotional budget was spent.